Analysis of ESET Live Grid, a sophisticated malware reporting and tracking system, shows that the highest number of detections this year INF/Autorun, with almost 5.17% of the total, was scored by the INF/Autorun class of threat. Win32/Sirefef.A is a trojan that redirects results of online search engines to web sites that contain adware. This is a spyware application that steals information from an infected computer and sends it to a remote location, creating a hidden user account, in order to allow communication over Remote Desktop connections. While there may be a number of clues to the presence of Win32/Spy.Ursnif.A on a system if you’re well-acquainted with esoteric Windows registry settings, its presence will probably not be noticed by the average user, who will not be able to see that the new account has been created. In any case it’s likely that the detail of settings used by the malware will change over its lifetime. Apart from making sure that security software (including a firewall and, of course, anti-virus software) is installed, active and kept up-to-date, users’ best defense is, as ever, to be cautious and proactive in patching, and in avoiding unexpected file downloads/transfers and attachments. 2012 on the ThreatBlog was far too busy to do justice to in a fairly short article: inevitably, I’ll have to leave out some articles. Nevertheless the following summary should at least give you an idea of how the year looked to the blogging team. January began with a flurry of Facebook-related activity, though it covered a wide range of related topics. Stephen Cobb wrote about the many scams that preyed on the popular dislike and distrust of Facebook’s imminent Timeline feature: Facebook’s timeline to fraud-a-geddon? In Facebook, your birthday #1, and survey scams I looked at Facebook memes like ‘the song that was #1 when I was born’ – in my case it was a snappy little number called Sumer is icumen in, I think. In Facebook Fakebook: New Trends in Carberp Activity, Aleksander Matrosov described some changes in the Carberp Trojan, including its gambit for extorting money from Facebook users by displaying a fake Facebook page when they tried to log into FB. The page claims that “Your Facebook account is temporary locked!” and instructs the victim to pay 20 Euros by Ukash voucher. Of course, other social media were targeted too, as Stephen pointed out in Tricky Twitter DM hack seeks your credentials, malware infection, and more. In fact, scams were a very prominent feature of the January threatscape: the first blog of the year, with some input from ESET Ireland’s Urban Schrott, looked at a 419 scam that the scammer took the trouble to translate into Irish Gaelic, though I can’t vouch for the quality of the translation: Irish 419-er seeks Spanish Lady. There was an echo much later in the year when the Irish Times reported the discovery of ‘the first Irish virus’, though it was actually ransomware rather than a real (self-replicative) virus, with the message translated into Irish: Irish Ransomware Report. Somewhat amusingly, Kafeine also drew my attention to a scam message targeting Ireland but translated into Iranian rather than Irish. Some miscommunication there… Ransomware Part III: another drop of the Irish. And Aryeh Goretsky warned us to Beware of SOPA Scams and ZeuS-related malware, rather bizarrely, passed itself off as a phishing message alert from US-CERT and the Anti-Phishing Working Group (Phishing and Taxes: a dead CERT?). Sebastian Bortnik flagged the way that Malware exploits death of North Korea’s Kim Jong-il. Passwords and passwording has been a pretty constant topic of interest this year, too. In Passwords, passphrases, and big numbers: first the good news… I flagged an interesting paper by Cormac Herley and Paul van Oorschot and linked to a number of resources from ESET and elsewhere that might be of use and interest (so I’m including them here). And as Cameron Camp described in Zappos.com breach – lessons learned, Zappos.com experienced one of the first major customer authentication breaches of the year but reacted promptly and efficiently. Cameron also had some good advice for those of us who were enjoying new toys of the tablet persuasion: New Year’s resolutions for securing your new tablet. Peter Stancik asked us if it was Time to check your DNS settings? and offered advice on how to tell if your system had been infected by DNSChanger malware in advance of the constantly shifting deadline for the shutting down of the servers that were keeping the owners of infected machines online after the botnet was taken down. We translated and published an English version of ESET Latin America’s predictions for 2012 – New White Paper “Trends for 2012: Malware Goes Mobile” – and Aryeh updated his paper on Possibly Unwanted Applications: Potentially Unwanted Applications White Paper Updated. In February, I came back to Facebook memes that might not be as harmless as they seem in an article for Virus Bulletin: Living the Meme, while in How to improve Facebook account protection with Login Approvals Stephen complimented Facebook on a security measure while clarifying its use. Cameron looked in CarrierIQ-style data gathering law to require mandatory notification/opt-in? at a bill requiring mandatory consumer consent prior to allowing the collection or transfer of data on smartphones: he also looked at Google’s attempts to beat back the rising tide of Android malware in Google responds to Android app Market security with stronger scanning measures, and at social media’s commoditization of its customer in Facebook/app data privacy – sharing gone wild, and finished the month with a searching examination of the BYOD trend. Inevitably, the run-up to Valentine’s Day saw lots of malicious activity, and Stephen addressed the problem comprehensively in Cookie-stuffing click-jackers rip off Victoria’s Secret Valentine’s giftcard seekers. I got the opportunity to talk to senior police officers in the UK about those PC support scams that I’ve been banging on about since before Columbus sailed the blue: Cybercrime and Punishment, and also Cybercrime, Cyberpolicing, and the Public. I also looked at some data from a survey conducted by Amárach Research on behalf of ESET Ireland, as blogged by Urban Schrott: Your Children and Online Safety, ESET North America CEO Andrew Lee returned to the topic of intellectual property, piracy and legislation: ACTA and TPP: The wrong approach to intellectual property protection. Aryeh Goretsky took a long hard look at Windows Phone 8: Security Heaven or Hell? On the technical analysis front, Aleksandr Matrosov and Eugene Rodionov shared some more research with us on Olmarik/TDL4: TDL4 reloaded: Purple Haze all in my brain. And Righard Zwienenberg, fresh to ESET but with many, many years in the security industry already, looked at Password management for non-obvious accounts. Cameron kicked us off in March with a series of reports from the huge RSA conference in San Francisco, and Stephen followed up in Information Security Disconnect: RSA, USB, AV, and reality. Several security gurus at RSA who should really have known better told Wired that they don’t use antivirus and strongly implied that no-one else should either: I responded to that in Security professionals DO use anti-virus. Stephen made available the excellent Malware Inc. presentation that he made at RSA – Changing how people see the malware threat: images can make a difference – and offered an infographic exploring all the data Google could, potentially exploit: Google’s data mining bonanza and your privacy: an infographic. He also considered the issues around employers requiring access to employee Facebook accounts and the spring crop of IRS-related scams: Facebook logins toxic for employers, violate security and privacy principles and Spring Brings Tax-related Scams, Spams, Phish, Malware, and the IRS. In April the questions of quasi-testing and the usefulness (or not) of anti-virus came up again. I finally posted a paper on the topic with Julio Canto of VirusTotal and engaged in a debate of sorts in SC Magazine: VirusTotal, Useful Engines, and Useful AV, and, along with Andrew Lee, tried to introduce a note of sanity into the ‘AV isn’t worth paying for’ debate: Free Anti-virus: Worth Every Penny? So that’s sorted that question? Unfortunately not: in December (see below) the same fallacies came up all over again. Aleksandr looked at a hot-off-the-press exploit kit technique: Exploit Kit plays with smart redirection (amended), and in Phishing Using HTML and Intranet Security Settings Righard dug deep into a rather novel approach to phishing – Phishing Using HTML and Intranet Security Settings – and gave some good advice following the deferment of the FBI’s shutdown of servers maintained following the takedown of DNSchanger botnets: DNS Changer (re)lived, new deadline: 9 July 2012! Stephen introduced another very popular infographic, this time on the Bring Your Own Device: BYOD Infographic: For security it’s not a pretty picture. A topic most of us have been asked about or written about many times this year, in blogs, conferences and interviews. He also looked at the legal imperatives that make establishing a WISP (Written Information Security Program) a good idea, Java, Macs and Flashbacks, and took a long hard look at QR Codes and NFC Chips: Preview-and-authorize should be default. Alexis Dorais-Joncas and Pierre-Marc Bureau both wrote about OSX/Malware (yes, Virginia, there is such a thing), Cameron wrote about Pinterest, and asked Could your next new car be hacked (should you be scared)? And I wrote about PC support scams. Quelle surprise. But maybe it’s never a waste of time to show people How to recognize a PC support scam. On May 1st I thought about going Morris dancing but instead I wrote about a support scam poll on behalf of the Internet Storm Center. For someone who stopped working the helpdesk in 2001, there seem to be an awful lot of support issues in my life. Since I spent most of the month at EICAR, CARO (Aleksandr blogged about his presentation there) and AMTSO, AMTSO in particular rather dominated my writing and even got me an unexpected interview with Infosecurity Magazine. I did have one moment of old-time AV nostalgia, though: Win32/Flamer: the 21st Century Whale. Stephen had good advice for travellers (thanks, Stephen: came in very useful!) in 11 Tips for protecting your data when you travel and Foreign Travel Malware Threat Alert: Watch out for hotel Internet connections. For stay-at-home, virtual travellers he had more advice in How to stop Twitter tracking you and keep private the websites you visit and made available a video giving the bad guy’s view of a remote access Trojan: Malware RATs can steal your data and your money, your privacy too. Aryeh posted about a new approach to cruise/vacation property scams: Press One if by LAN, Two if by Sea… And Cameron posted on SMSmishing (SMS Text Phishing) – how to spot and avoid scams, Millions have not reviewed Facebook privacy settings: Here’s how, and DNSChanger ‘temporary’ DNS servers go dark soon: is your computer really fixed? In June, Stuxnet and its siblings (or offspring) became a big issue (again): not only because of the fuss about Flamer, but because it suddenly seemed that the US government was claiming part of the credit for Stuxnet, at least. Stephen spoke for us all when he said Stuxnet, Flamer, Flame, Whatever Name: There’s just no good malware, and made more good points on The negative impact on GDP of state-sponsored malware like Stuxnet and Flame . He provided more travel advice in Data security and digital privacy on the road, what travelers should know but while the holiday season was just getting into its swing in the Northern hemisphere, he warned that Back to school scams? They may be just around the corner, and advised on how to spot them. Aryeh, meanwhile, was beset by scams in SMSmishing Unabated: Best Buy targeted by fake gift card campaign and Close Call with a Caribbean Cruise Line Scam. He seems to have become inextricably entangled with cruise scams in the same way that I have with support scams. We both had something to say on the perennial topic of passwords and PINs: Guarding against password reset attacks with pen and paper and Passwords and PINs: the worst choices. But I did manage to get a little time out in Slovenia (and got very sunburnt in Venice), though I was basically there for a conference at the behest of Urban Schrott, of ESET Ireland. Cameron was mainly focused on social networking, from Google to LinkedIn to Facebook (Your Facebook account will be terminated – again and Facebook policy changes – does the ‘crowd’ really have a seat at the table?). He still found time to indulge his passion for automotive security, though: How much will your driverless car know about you (and who will it tell)? On the technical analysis side, Jean-Ian Boutin looked at Win32/Gataka and Robert Lipovsky and Righard Zwienenberg both looked at ACAD/Medre. Meanwhile, Aleksandr Matrosov and I both talked about the ZeroAccess rootkit, while Aleks noted some interesting data around CVE2012-1889: MSXML use-after-free vulnerability. In July, Aryeh blogged about .ASIA Domain Name Scams Still Going Strong instead of cruise line scams and I blogged a couple of times about support scam gambits. Ho, hum. Peter Stancik and myself addressed in several blogs the issue of the final deadline for the turning off of the FBI’s servers substituting for the DNSChanger servers. If there’s anyone out still out there who doesn’t have Internet access any more, I don’t think you can blame us. Righard found some Scareware on the Piggy-Back of ACAD/Medre.A. Aleks blogged about Flame and its siblings and predecessors, updates to the Rovnix framework, Java exploitation, and legal assaults on the Carberp botnet (yay!). There were more issues with passwords that Stephen and I couldn’t resist blogging about: Passwords of Plenty*: what 442773 leaked Yahoo! accounts can tell us and Password Party Weekend? Millions exposed now include Phandroid, Nvidia, me. Stephen also commented on an Instagram vulnerability. Cameron blogged his socks off about BlackHat, Defcon, Free YouTube .mp3 converters – with a free malware bonus, and Gamigo game site hack – lessons learned (and what should you do), and UK journalist Kevin Townsend turned my thoughts to Rakshasha, Hindu demon and allegedly permanent and undetectable backdoor. I think not. Robert Lipovsky blogged about Quervar – Induc.C reincarnate? and there was an unexpected intersection between technical analysis and support scams: Support scams and Quervar/Dorifel. In fact, there was a lot of action around support scams this month: AMMYY, whose remote access service is often misused by Indian scammers (in the US, it’s often referred to as the AMMYY scam), came up with some useful information and a warning, while one of the scammers who ring me with monotonous regularity provided a little light relief: Support Scammer Anna’s CLSID confusion. All good material for the presentations on the topic I’d be making at CFET and Virus Bulletin in September. Cameron picked up on Mac OSX/iOS hacks at Blackhat – are scammers setting their sights?, Blizzard Entertainment hacking, and photo tagging on Facebook. Stephen offered excellent advice: Java zero day = time to disable Java, in your browser at least. Cameron also blogged at some length about the FinFisher spyware and I took up the theme when one of our readers asked about ESET’s detection of the spyware (which we detect as Win32/Belasek.D): Finfisher and the Ethics of Detection. While I’ve previously talked about the Top Umpteen bad choices of password, I got fed up with all the journalists simply listing over-used passwords as if all you have to do is not use the top 25 and you’re safe, and tried to adopt a more constructive approach: Bad password choices: don’t miss the point. However, one of my blogs that month came directly from a conversation with one of the more technically competent journalists working in security, The Register’s John Leyden: Carbon Dating and Malware Detection. September was also fairly quiet in the run-up to the Virus Bulletin conference: like most of the anti-malware industry, we consider VB to be one of the most important events of the year, and as you’ll see from my summary of ESET’s papers and articles in 2012, we had a lot of presentations to prepare for. Righard and I also presented at a small but invariably interesting forensics conference at Canterbury, in the UK. While I was there, I grabbed an opportunistic photo on my phone that I was able to use almost immediately for a blog on ATM/cashpoint security: again, it derived from an article by a knowledgeable journalist specializing in computer security, the estimable Brian Krebs: ATM Security? Don’t bank on it. Sadly, Pierre-Marc Bureau doesn’t often find time to contribute to the blog these days, but when he does, it’s always worth reading, and Dancing Penguins – A Case of Organized Android Pay Per Install was no exception. Aryeh also looked at Android security in The Dynamic Duo for Securing your Android: Common Sense and Security Software. And Pierre-Marc also summarized the state of (non-)play with OSX/Flashback in Flashback Wrap Up. We came across the ‘first Irish virus’ which appears to have been non-viral ransomware with the message translated into (Irish) Gaelic (Gaeilge). Actually, thanks to researcher ‘Kafeine’ I subsequently got to see examples of other messages regionalized for other countries and languages. While this kind of malicious activity is no laughing matter, I did get some amusement out of the fact that one example inadvertently used some French text among the Gaeilge, and another apparently got confused between the .ir and .ie Top Level Domains and generated text in Iranian language apparently intended to target speakers of Gaeilge. I also returned to the topic of PIN selection strategies, commenting on research from DataGenetics: Choosing a non-obvious PIN. Cameron wrote about Facebook timeline security & privacy: steps to keep your account & identity safe, and followed up with Facebook timeline privacy/security: protect your account and identity (2/2). And in a slightly unusual case of the source quoting the journalist(s) I cited conversations with and articles by Kevin Townsend, Dan Raywood, and John Leyden in a post on malware inserted into the supply chain: Nitol Botnet: You Will Never Break The Chain. In October, Cameron blogged about a free Android app from ESET available from Google Play to protect Android devices from the USSD vulnerability: Free Android USSD vulnerability protection from ESET now on Google Play. Aryeh also shared some product information: W8ing for V6: What ESET has in store for Windows 8 Users. Stephen asked, given that October was National Cyber Security Awareness Month, whether How’s Your Cyber Security Awareness? Or, do we really need security training? (the answer was yes!) By way of follow-up he disclosed the results of a Harris Poll that found that Younger people less secure online than their elders new study suggests, and in Brutalized! South Carolina breach exposes data security woes at State level, observed that 86% of state CISOs identified “lack of sufficient funding” as the key barrier to addressing cybersecurity. He also picked up on concerns about threats inserted into the supply chain, this time with reference to government paranoia: Huawei? The how, what, and why of telecom supply chain threats. November inevitably continued some similar themes. On the technical front, Jean-Ian Boutin looked at the latest developments concerning Win32/Gataka – or should we say Zutick? Pablo Ramos wrote two blogs on Android/TrojanSMS.Boxer.AA, one of them a deep-dive technical analysis and the other aimed at a more general audience: Don’t pay high phone bills: SMS Trojans can trick you via premium-rate numbers. This is an approach we’d like to make more use of, giving our less technical audience a view of why certain malicious technology has an impact on their online lives without boring them with programmatic esoterica, but doing so is something of a challenge for a small blogging team. Writing technical content that is relevant and interesting to the lay reader but still accurate is as demanding in its own way as heavily technical material. In Win32/Morto – Made in China, now with PE file infection, Pierre-Marc managed to find a balance between the two that appealed to a wide range of readers. In Wauchos Warhorse rides again I looked at an interesting spike spotted by Stephen in UK detections of an elderly malware family. Statistical artifacts are interesting, but not always explicable. Aryeh is the team expert on Windows 8, but in Windows 8: there’s more to security than the Operating System I looked at the way current events (such as the release of Win8 and Hurricane Sandy become fodder for social engineering attacks, and in Premium Rate Scams and Hoaxes I looked at a very different aspect of Premium Rate misuse to that blogged by Pablo. In Support Scams and the Surveillance Society and New Support Scam Gambits: Frozen Virus a Frozen Turkey I looked at some new evolutions in PC support scamming. Stephen followed up his speculations on a new angle on data theft (Digital photos demand a second look as picture-stealing threat develops) with a very useful, very popular seasonal piece on Safer cyber-shopping makes for happier holidays: 12 simple safety tips. At the time of writing, December is barely half-way through and already shaping up to be as eventful as any other month this year. There was another Mac-specific attack on Tibetan activists – Spying on Tibetan sympathisers and activists: Double Dockster – while Stephen returned to the vexatious topic of passwording in Password handling: challenges, costs, and current behavior (now with infographic). It’s frustrating that such a flawed and heavily exploited authentication technology still dominates our online lives. The security industry suddenly woke up to the fact that despite Microsoft’s attempts to eradicate the misuse of the Autorun functionality in removable media, threats that use that vector continue to thrive. This wasn’t exactly news to us: INF/Autorun and its siblings have been dominating our threat reports all along. However, Stephen generated some interesting and useful new material on the topic in My Little Pronny: Autorun worms continue to turn and Are your USB flash drives an infectious malware delivery system? I was overcome by nostalgia after receiving a 419 claiming to be from the wife of a former Nigerian Head of State: Maryam Abacha rides again: yes, Virginia, there IS a Sani-ty Clause!*. Ontinet’s Josep Albors directed my attention to the murky world of boiler room scams and alternative investment scams in Diamonds are forever, and so are investment scams. ESET Latin America offered their predictions for malware trends in 2013 in a paper announced by Sebastian Bortnik: Trends for 2013: astounding growth of mobile malware. Unsurprisingly, Android malware is prominently featured. 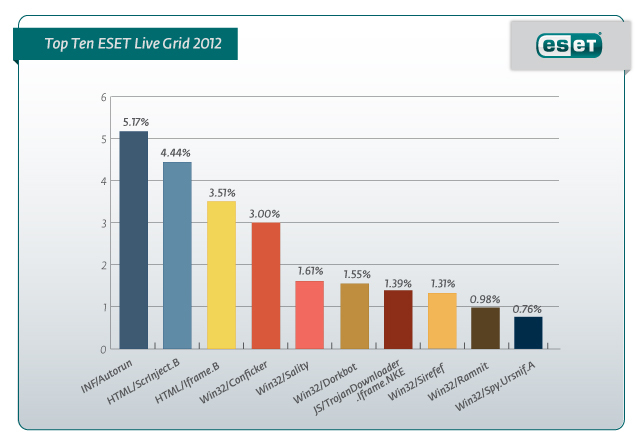 Other ESET researchers looked into their own crystal balls a little later in the month. Aleks updated ongoing research on the vulnerabilities in smartcard systems used for banking with news of Win32/Spy.Rambus. Pablo returned to the topic of Dorkbot, the subject of his paper at the Virus Bulletin conference. And Aryeh kicked off a highly seasonal series on securing those Christmas computing goodies. A lot of interest was generated by Pierre-Marc’s report of malicious activity in the Linux realm, which prompted talk of a “malicious Apache module” which then prompted a further post to clarify the implications of that phrase.